Rain and wind did not daunt staunch volunteers and visitors on 16th March 2013: 7 degrees, 20mph winds and 50% chance of precipitation. Can’t complain really as at least now the weather was warmer and not untypical of March. Still, you could see vapour clouds of heat when you dug into the compost pile – hot in there! A good sign as it shows it was full of life, the microfauna respiring and producing heat. Pam and I put out the Big Dig bunting in driving rain – growers are ever optimists. With Victor, Parks Manager, the decision was made not to put up marquees in the wind. In fact key volunteers Diana, Pam and me simply braved the rain and chatted, shovelled and signed up vistors 11 – 2 or so, fortified by chat, hot drinks from the cafe and a special offer on chocolate digestives. We missed Bea, sick in bed – get well soon! Networking! Laura from TT Crystal Palace and Pamela from Cressingham Gardens in Tulse Hill got shovelling, as did Master Gardener Cleopatra who came all the way from Croydon to help a Lambeth friend with compost collection. Niall, Awot and Paul from Crystal Palace, Jake from Remakery Brixton, Jill from Brixton Hill, Rob from Streatham Hill and Mary were some of the other mad shovellers and visitors while we were there – 40 or more in total. Collection means included compost bag and M&S carrier reuse, bike trailers and some cars, and later Marianne from Notredame estate came by with her supermarket trolley – yay! See more pictures on our flickr photoststream (click) or on Facebook (click and please like or become our friend). David (and later Helen) from CCMAC came by and offered encouragement and support. Emma from Brixton People’s Kitchen (and Lambeth Living) popped by too before she and I headed off at 3 to Tulse Hill for our other resident projects there. Diana our treasure of a treasurer was ever ready with the membership leaflet – £5 a baragain for standard membership. Please support us with a membership and even a donation, http://bandstandbeds.org.uk/membership. 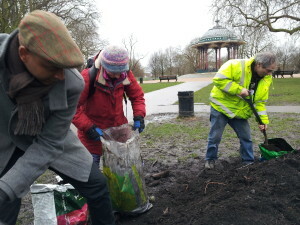 Lots of interaction with other Common users including the Barefoot runners who warmed their feet on the compost; I was inspired by this way of connecting to the earth! Also myriad dogs/dog walkers including Ella and Stuart who came back later to collect the stuff. Growing information. We looked at the germination, root structure and nitrogen fixing root nodules on one of the broad bean plants we sowed in November (follow the photo links) and also explained the green manure crops. People were also curious about the source of the compost. It’s green waste collected from the Common which has been stored in the depot on Windmill drive. It’s excellent as a soil conditioner (you place a 2 – 7cm, say, layer on top of your beds and allow worms to incorporate it) or mixed with loam and well-rotted manure for container growing, ideally. Bandstand Beds wants to hear from you. Did you come by? Want to know more? Want to get involved? Want to support us? Post a comment or otherwise contact us please! We’d really love to see more regulars on the Common active on the project, as well as the wider Lambeth/Wandsworth groups that come along through the food and growing networks. We have lots of jobs if you’d like to join the committee, too. Find out more about our events through the year, and the Squash and Bean Swap for the Chelsea Fringe and beyond. Lovely if you can make it to thelaunch on Thursday at St Annes’s Hall in Venn St, 7 – 9, SW4 0BN.